Post-Påsk addendum: A quick addendum about Easter here—like kids asking for candy, there are some more Halloween-ish prank traditions associated with this holiday. At fika Thursday, V. mentioned that this is the week during which you are supposed to do silly things like sneak "Kick me" signs onto the backs of unsuspecting classmates or colleagues (I didn't notice anyone doing this, but I checked myself when I got back to my office), and Z. said mentioned that when she lived in a large apartment with several roommates, someone switched all the labels on their personal foodstuffs. The oddest thing that happened this week was that all members of my department got an email from the boss on Friday, written so she said from her husband's email address, saying that her office had burned down because her broom had backfired as she was on her way to Blåhall, so she won't be getting out emails for a while. The last last sentence from the mysterious email said that the firemen advised her to go home and drink something strong. It is not clear to me whether this is her joke on us, or her perhaps her husband's joke on her, but I guess I'll find out Tuesday, when the normal work schedule resumes. Well, it turns out it was no joke whatsoever. 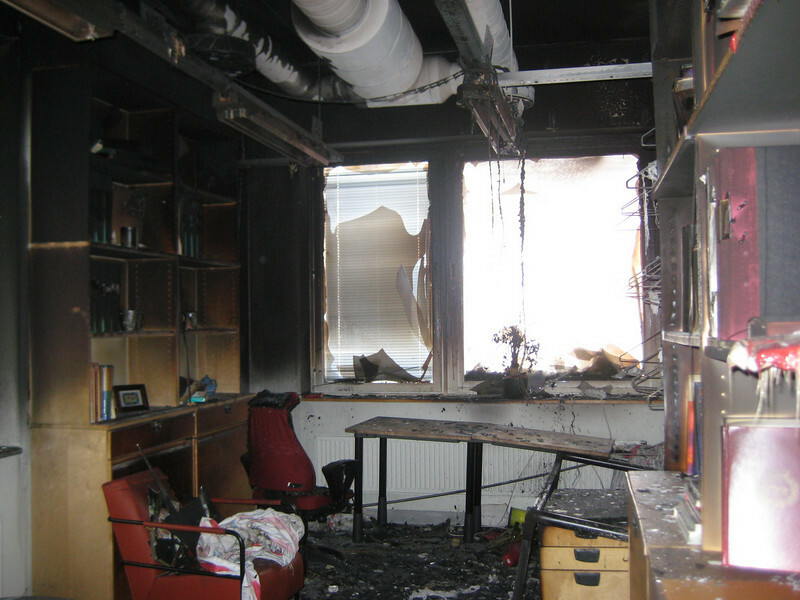 My advisor's office (and the adjacent office, and part of the main lab) got burned to a crisp last Friday. She was working in the afternoon, reading in the break area, when the fire broke out in her office and smoke started pouring out of her office door. She sounded the alarm and got out, after initially trying to put it out herself. Fortunately no one was hurt (being a holiday, no one else was around), the things that were lost are replaceable, and in a strange coincidence, earlier in the week she had just moved some personal items that would have been irreplaceable.